Miss World started with a new way of introducing the contestants through a pre-taped video of the contestants introducing themselves showing off their beautiful gowns. Once introductions were over, the contestants divided in three groups i.e. blue, white and red took the stage dancing to a choreography number separately. The song used “That’s my girl” doesn’t remind me of the group (Fifth Harmony) who sang the song but Miss Earth. There was nothing original in the choreography neither the song. The contestants dressed in cocktail dress of Blue, white and Red, some holding a pom poms, looked like they were ready to break into a dance mood in the middle of some games. With the American Flag behind while the queens stood on stage in a dress to match American Flag, it seemed like more of ‘An all American Dream’ program. On seeing that I joked to a friend, they seemed ready to say “All Hail America” than “All Hail the Queen”. And with the current political scenario of the U S, the theme of this year sounded like an homage to ‘Make America Great Again”. The Winners of Fast Track event were announced. 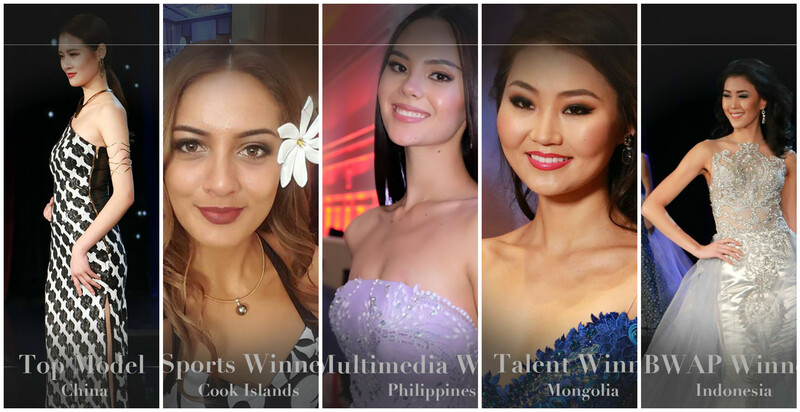 People’s Republic of China as Top Model, Philippines as Multimedia contest, Mongolia as Talent winner and Cook Island as Sports winner. 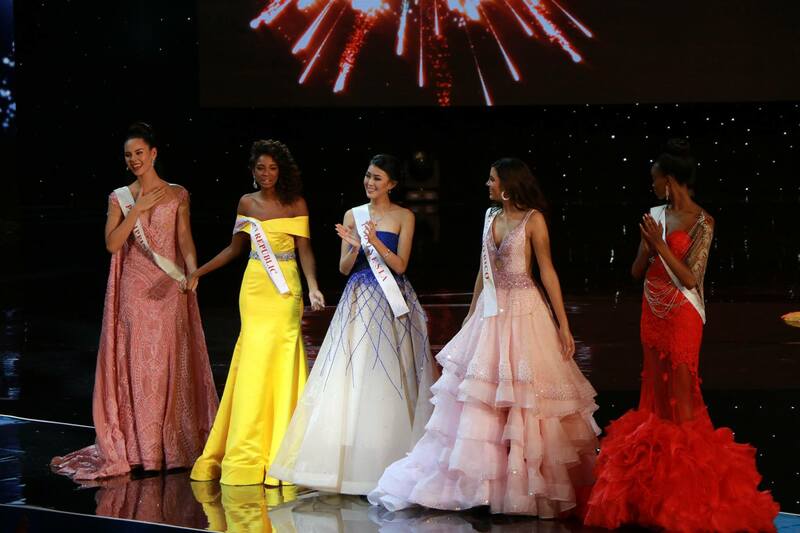 The BWAP top 5 took the stage in their evening gown – India, Nepal, Indonesia, Kenya and Philippines. I knew that Indonesia would win this award. Indonesia always come up with a project that accomplished its goal within a short span of time. Once again all the contestants took the stage and danced to a song called ‘Emergency’ by Icona Pop. This time all the ladies wore plain and simple black dress. Then top 20 were announced. People’s Republic of China – the winner of Top Model was the first one. Don’t know whether the top 20 were scored during this presentation or not. She definitely deserved her placement in the top 20 being a top model winner. A stunning face with a calm aura. The winner of Multimedia – Philippines was the second one to take a walk. She exudes such calmness and serenity. She definitely fills the stage with her warm personality. Cook Island – Sports winner followed. It’s nice to see small nation and weak sash making a mark in beauty contest like Miss World unlike other pageant where it will be difficult to enter the top 10, 15 or 20. Talent winner Mongolia walked like she owned the stage. Though it might not be as dramatic as her previous pageant stint, she still has the diva in her. It is an absolute delight to see her walked on stage again. Indonesia, winner of BWAP, might not be the best in terms of facial beauty but her strong personality speaks for her. This is Miss World we are talking about. France transformations post her win at Miss France is absolutely amazing. It always feel good to see colour girl representing a country like France where beauty is very much concentrated. Tall and captivating beauty, Kenya followed. She was one of my personal favourites. I just can take my eyes off her. What an incredible presence she had on stage. The host United State came in looking all cheerful. She looks short but when she stands with other contestants you can noticed she is actually very tall. India looked so fresh and young. After failing to place last year, Indian fans can rejoice and be happy with the placement. I will always be very proud of Miss India. Slovekia was very striking and she is the second Slovakian to enter the top 20 in Miss World after 1993, the first one coming from Karolína Chomisteková in 2013. Belgium bright smile was so pleasant and looked radiant. The Queen or Miss World was next. Puerto Rico, apart from her amazing modelesque appearance and exuberant presence, she has an international face. That really works her. She can pass off as any citizen of the world. Australia has been doing well in Miss World contest. Being one of the top 24 finalists of BWAP and Miss World Sports, and now a top 20 finalist, she continued placement streak of Australia since 2012. Thailand another strong Asian delegates. It amazed me to see how the southeast Asian countries are so serious and support of their queens. Thailand like Indonesia and Vietnam, is slowly emerging as the one to beat in the world of beauty pageant. Brazil, Beatrice Fontoura, entered looking like a Hollywood star. With her hain in a bun, cheery smile and walking so composed, she does resemble the actress Catherine Zeta Jones. But everytime I hear Brazil; I am reminded of Miss World Brazil 2015 Catharina Choi Nunes. I will always be reminded of her. Ghana walked in beauty – so soft and so calm. It’s always a happy feeling to see African countries entering the semi – final round and beyond in any beauty pageant. I will always have a soft spot for Africa. Japan inclusion wasn’t a surprise to me. Winning her national pageant says a lot for her as a bi-racial. She must have something that outshined the full blooded Japanese contestants. Another strong delegate who gave an exceptional performance was Dominican Republic. Graceful and eloquent, she is outstanding in every aspect. The Favourite of many pageant portals, Hungary followed and she definitely had a lot of supporters in the crowd. Her beauty is just mesmerizing. Another country I have a soft spot for, Miss Korea was the one end the round. Her inclusion might have surprised many but I am just happy to see her in the top 20. Of course, she is beautiful and charming. The top 11 were about to be announced. The top 20 dressed in their elegant gowns stood backstage along with the host Jason Cook who had the result with him. It would have been so much better had the quarter finalists walked on stage in their gowns instead of the not so flattering black dress in that black dress round. We would have seen more variety and colours. When the top 10 finalist were called their video were shown where they spoke about their live, journey, ambitions and beauty with a purpose project. Philippines was the first one to be called on stage. The hair bun and the gown was so Miss India of the 90’s and early 2000’s. Indian delegates would always had the same type of hair style and carry almost similar type of gown for the finale in their respective pageants. Catriona with her queenly aura was a good choice to open this segment. Indonesia was the second to make it to the top 10. This gown was a Wow gown in terms of colour combinations, the design and the applique work on the gown. It made her look so refined. Belgium radiated her shiny personality in her yellow mermaid train gown. Guess she was too happy to not realize she was walking too fast in that tight gown that she almost tripped. Gorgeous and remarkable gown – that’s what I felt when Brazil came on stage. The silver embellished number looks so artistic and decorative. And Beatrice carried it like a true Holywood star ready to rock the red carpet. Kenya was up next. After seeing her in this fiery red number during the top 5 BWAP round, I was awestruck. It was exciting to see her more in that gown. Though the fitted mermaid train gown has been seen before in pageants, what made it work was Evelyn’s tall stature and strong presence. The silver drape on the gown added more features to the gown. It was simply exquisite. The host country USA was the sixth finalist. She wore a rather pageant patty gown and somewhat similar to Philippines gown. The cuts on sides of the gown, the cape and the flowing over lay elongated her. The top model winner People’s Republic of China wore a gown that was inspired from her own country. From the collar to the applique work to the design, it was eastern culture meets western dress. Having a perfect looks and body made this gown very high end and classy. Next lucky contestant was Dominican Republic. Just looking at her, it feels so positive. Her off shoulder yellow gown was another reason for that. Trust when Jeannie Mai says ‘Yellow is the colour of Joy ‘ provided you have a beaming face and cheerful personality like Yaritza Reyes. Puerto Rico dazzles in multi layered skirt gown. The sequins give a sparkling effect on the gown and her bewitching persona. Korea was the tenth finalist and she wore a sparkling blue gown. Korea looked so soft and delicate and the gown was just perfect for her. The 11th finalist or winner of Popular voting contest was Mongolia. I thought she will be called much earlier than the 11th spot. Nevertheless I was quite happy to see her in the semi-final. I loved the detailing done on the blue gown. The cuts and lines were creative and very Haute-Couture. I really wish there was an evening gown. Then we could have seen more from her and who knows she might just bowl over us like she did in Miss Earth 2016 evening gown competition. Megan – What is the ultimate purpose of everything that you do? Miss Philippines – Well like any creative, my purpose is to make people think feel and ultimately connect with one another like you know when a song makes you feel like no matter what you’re going through you’re not alone and If I can contribute to society and somehow give back to the community I have achieved my creative purpose. Megan – You are Bwap winner and you were talking about how you wanted to help children, how do you do so by living for others? Miss Indonesia – In this life, I have one desire that I will always to become and impact and also a blessing for others live, for my beloved country Indonesia and for this world. That’s why I always knowing that my life is not mine but also its my responsibility to share my life, to share my blessings that I already had to others in this life in this, in this world and to use my potential, maximise my potential in order to give back to communities. Megan – You mentioned you wanna help out in your own way. How do you think you can make this world a better place in your own way? Miss Belgium – I think being healthy is the most important thing in life and I wish for everyone to be healthy or atleast to have access to healthcare. So I want to be a part in that. That’s why I am studying medicine to become a doctor. Megan – You left home at such a young age. Tell us what you’re doing now. Miss Brazil – Now I am in Law school and when I finish I tend to focus my work, working with child abuse and women that has suffered domestic violence, working for towards that I think I can really help and once with if I become Miss World I want to make this a global platform. Megan – I am sure you make a lot of people happy and you’re very ambitious but what would you say is your biggest dream? Megan – Miss World is all about beauty with a purpose but do you feel there’s some kind of stereotype when it comes to beauty contest? Miss United States – I do. I feel like when you introduce yourself to somebody and they find out you’ve competed in a beauty pageant they kind of have this reaction but I’ve spent the last three weeks with the most incredible women I’ve ever met in my entire life and the most talented women, multi most incredible dancer I’ve ever seen. My roommate is in Law school, Australia. So we have so many different things to offer I think and when they really dive in and realize what is beauty pageant and not just that but what Miss World has to offer. It’s incredibly special. Megan – When you travel, you always want to bring something home. What kind of souvenir do you think you’re going to bring home from the pageant this year? People’s Republic of China – I bought a T-shirt and write down all of the contestants signature, write down and I think it was very treasured. Megan – What is your main objective in the future life that you have? Miss Dominican Republic – My main objective in life is to be a better version of myself every single day. So even if it’s a small thing that I could be that I could be represent people and their heart. I know how to work hard is. I come from a very poor humble background but that never stopped me. But Instead that encouraged me to keep reaching out for my dreams and I want to tell people that it doesn’t matter where you’re from, your colour, your race. You can always accomplish your dreams if you work hard. Megan – Art is really important to you and you wanna share that with the people around you. Miss Korea – Yes I do. Art has always been my best friend, life teacher and a healer and I wanna share those wonderful powers of art by becoming art therapists who takes care after the broken hearts especially of children because today children are burdened by the demanding society and they are hindered from expressing their true selves. Megan – Well you did perform your talent. That’s a great thing and it was a little bit crazy if you think about it so what’s the another crazy thing that you’ve done in you’re life? All of them were so impressive in this round. All spoke based on their life journey. And they all delivered well. I love the fact that they were very honest in their answers and didn’t give a too pageant patty answer. I love the answer of Miss China and Miss Mongolia answers on a personal level. This is not in terms of who gave the best answers. Being a travel freak myself, I can relate to both answers. Who wouldn’t want a souvenir that has a signature of beauty queens on a shirt and who wouldn’t want to go on an adventure trip? Once this round was over, the top 5 were chosen and it wasn’t a surprised to see Philippines, Dominican Republic, Kenya, Indonesia and Puerto Rico in the top 5. Like last year, this year top 5 were a perfect. The top 5 once again had to face question and answer round. Kenya: What we can do to improve education in the world.. Obviously, it begins with empowering every child to understand that education is important, and Nelson Mandela said that it is the weapon that a child can use to face the future. So first let’s educate our parents that education is important and then we shall have all children on board to achieve their dreams. Miss World 1975, Wilnelia Lady Forsyth: If you have an opportunity to change something about the world, what would it be? Puerto Rico: If I have the opportunity to change something about the world, I think what I would do is send a message of how important it is to change exclusion for acceptance, to promote and provide justice for others, and the importance of helping those in need. Thank you. Miss World 2002, Azra Akin: How would you convince others to help their communities? Miss World 2008, Ksenia Sukhinova: What do you think should we be teaching the next generation about protecting our planet? Dominican Republic: I think we should be teaching our next generation to protect our planet. This is the only one we have. We shall protect Mother Earth. We should all be together and encourage communities and contribute with making campaigns so people can collect their trash. We have already global warming. We cannot stop it but we can enhance opportunities to make it better. Miss World 2015, Mireia Lalaguna: Which qualities do you think it will take to wear my crown? Philippines: I think, first of all, it takes bravery. To be a Miss World is to carry a burning torch. It is like action carried out by one to illuminate the lives of many. And I would dedicate my whole self, my love for the arts and my voice to try to uplift, empower and educate people. And it would be my greatest honour and duty to hold this torch high enough so that all the world could feel and see its light. Thank you. This year Miss World Org. scrapped the traditional question “Why should you be our next Miss World?” except when the reigning Miss World asked Miss Philippines and instead we get to see brilliant questions from former Miss World winners and impressive answers from the top 5. A welcome change indeed!. I am not sure if Puerto Rico was crowned based on this round but I love her answer the best. It was short and powerful. Kenya looked nervous while answering. It will always be nerve wrecking if you’re the first person to open a segment. Philippines answer sounded similar to her answer in Miss World Philippines contest given the fact both the question were similar in nature. Hearing Dominican Republic answer I felt like watching Miss Earth the second time. First one was when the intro background song was similar to the one used in Miss Earth and now this ‘Save the planet’ question and Mother Earth answer. Indonesia answer made sense since it is always starts from us. Change starts from You and I, not from others. In the end, Puerto Rico was crowned Miss World 2016 over the favourites like Philippines, Dominican Republic, Kenya Mexico and many others. Speaking about Mexico, I missed her in the top 20. Her exclusion was surprising but this is something only the judges know. Miss Puerto Rico deserved the crown. Her performance, amazing stage presence, calming aura and composed personality justify why the she should wear the blue crown. As for the show, being in the U S didn’t help much to get media attention. It does lived upto it’s promised of bringing certain changes. The opening number and question and answer round were a welcome change. The video of the top 10 were also impressive. Miss World Org deserves a pat on their back. But scrapping Dances of the World and adding more don’t make it a great show and entertaining like others. The leader board might have been scrapped but the way top 10 were announced, it was like the way it used to be – from the top scorer to the last. Despite all these, I will always be a Miss World fan. This year might not have been the best one but Miss World will always a loyal fan and supporter.